In part, this section is attempting to provide some historical context to the current position of science, which we might characterise in terms of just two main schools of thought, i.e. 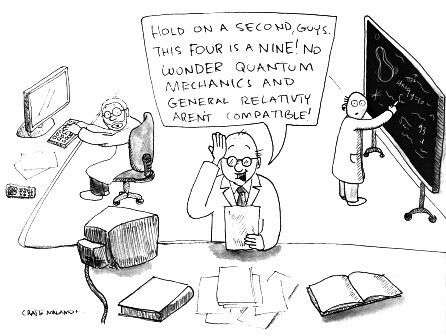 relativity and quantum theory. As has been previously outlined, our universe may appear to be little more than empty space. However, a quantum physicist might question the energy density as defined by the cosmological gravitational model and general relativity, as quantum field theory (QFT) has a different perspective in which our universe is constructed of various quantum fields, although the physical reality these fields is still subject to much debate. QFT defines 12 fundamental quantum fields for fermions, i.e. 6 quarks and 6 leptons, and another 12 fundamental fields for bosons, not forgetting the 1 for the Higgs boson. Note: The idea of the quantum energy density is often anchored to the idea of electromagnetic waves propagating through space at the speed of light [c]. However, in quantum theory, these waves are not necessarily ‘substantive’ and are often described in terms of ripples in the state of a theoretical quantum field. Then, almost in contradiction, these ‘waves’ are assumed to carry energy, and momentum, with a specific direction and frequency that are described in terms of 'propagating modes’ of the electromagnetic field, where each mode might be modelled as a harmonic oscillator having a minimum average energy [E=hf/2]. While this is a very small quantum of energy, the number of modes is almost infinite, such that the energy density is determined by the density of modes times the energy per mode that increases as a function of the cube of frequency per unit frequency per unit volume. This product of a tiny energy per mode multiplied by a near infinite density of modes yields the theoretical value of the zero-point energy density, which is some 110 orders of magnitude greater than the radiant energy at the centre of the Sun. While none of the technical issues surrounding this energy estimate, sometimes referred to as the zero-point energy-density, have really been detailed, we will therefore table a question. How is this huge energy density reconciled with general relativity, i.e. 4.6*10113J/m3 versus 8.53*10-10J/m3? Again, at this point, it is probably fair to say that there has never been an accepted resolution of this fundamental disconnect between the two main scientific theories, i.e. relativity and quantum field theory. So, having only highlighted this issue, we might turn our attention to another implication of the QFT model, which suggests that any displacement of a quantum field would propagate through the field as described by some 'appropriate' wave function. So is QFT essentially a wave model? At this point, any accepted response to this question can appear ambiguous, especially if we adopt the semantics of the duality of wave-particles. However, possibly to avoid this ambiguity, a fundamental particle like the electron is often described in terms of an 'excitation' within its own quantum field, where the wave function itself is a complex-valued probability amplitude, the result of which only defines the probability for some given outcome. So is QFT a description of physical reality? Possibly not. For many will argue that this was never the primary objective of this model, where some now question the necessity of any physical reality beyond its mathematical description. For example, some argue that the fundamental ‘fabric’ of the universe is not matter or energy, but information, although it is difficult to perceived any case where information, even when reduced to a single bit, does not rest on some form of physical reality. However, while this idea may appear acceptable, and even attractive, to mathematicians and some theoretical physicists, which can then also be debated endlessly by philosophers, this discussion is more interested in whether the idea of physical ‘cause and effect' still has a role to play in fundamental physics. OK, but what about the nature of physical reality as described by relativity? Historically, the idea of 'space-time' has also been subject to many mathematical descriptions, which might initially be anchored in Euclidean geometry and then developed to include the tensor-differential geometry underpinning general relativity. However, by the 19th century, most scientists were beginning to accept the idea of space as a medium of wave propagation, especially after the publication of Maxwell's electromagnetic theory in 1864. As a consequence, by 1875, Michelson-Morley were attempting to prove the existence of space, as a wave medium, via an experiment using an interferometer. However, the unexpected negative results of this experiment would eventually lead to Einstein's theory of special relativity (1905) and the apparent rejection of spacetime as a wave propagation media. However, it could be argued that the subsequent development of general relativity (1915) only added to the ambiguous nature of spacetime, which could apparently be subject to curvature and support gravitational waves. So what is the nature of space and time? We might start by reflecting that both quantum physics and relativity are constrained to produce results that are compatible with classical physics on certain scales of space and time. Such a constraint would also apply to any WSE model and that its results would also have to be compatible with both quantum physics and relativity on certain scales of space and time, although not necessarily explained in the same way. In this context, we might realise that in order to be compatible with quantum physics and the particle model it supports, any WSE model would have to exist on a scale smaller than the sub-atomic domain, where 'particles' start to emerge and possibly as small as the Planck scale. Equally, given the apparent level of empirical verification supporting relativity, any WSE model would have to explain why there are different perceptions of space and time in different frames of reference. So what would be the fundamental components of any WSE model? What is a particle in the WSE model? Based on Einstein's energy equation [E=mc2] and Planck's equation [E=hf], we might reasonably start with the idea that particles are some form of localised energy-density. If so, we would also have to return to the issue that energy is a scalar quantity, which cannot propagate through space-time without some physical cause and effect mechanism, such that a wave model of some description might be pursued. So what attributes would these waves require? In many respects, a mechanical wave that physically propagates through a wave media only has three causal attributes, amplitude [A], frequency [f] and propagation velocity [c] from which wavelength [λ=c/f] can then derived. Quantum mechanics then provides a causal link between the frequency [f] attribute of a wave and its energy [E] using the Planck relationship [E=hf], although it does not really explain the physical mechanism by which this energy [E] is transported through a spatial medium [xyz] as a function of time [t] in the absence of any mention of a wave amplitude [A]. Of course, within a mechanical wave model, the amplitude [A] of the wave is representative of a displacement of the wave media, where the square of this amplitude [A2] is proportional to the potential energy [E] and where the wave propagation velocity [c] would be an attribute of the wave media itself. Note: The issue of the absence of any wave amplitude [A] in Planck’s energy equation [E=hf] is addressed in a latter sub-section under A Matter of Inquiry . However, we might guess that the idea of amplitude might have gotten ‘lost’ in the definition of Planck’s constant [h], which has units of energy-seconds. How could this simple wave model support all the properties associated with particles? Concepts that have proven useful in ordering things easily achieve such an authority that we forget their mundane origin and accept them as unalterable facts. Scientific progress is often stalled for a long time by such errors. Of course, those who may wish to be advocates of some sort of WSE model must still actually prove their case. However, as outlined in the introduction, it is assumed that a WSE model would be generally predicated on the idea of waves, which physically propagate through the medium of space as a function of time. But could a WSE model be based on the principles of mechanical waves? As a generalisation, when considering any speculative model, we often start with a number of preconceived ideas about the various standard models of physics, e.g. particle model versus quantum field model or alternatively the relativistic model versus quantum model which then underpin other models, e.g. the cosmological model , in possibly contradictory ways. In the overall context of the Mysearch website, reservations have already been highlighted about some of the assumptions of all these models, while accepting that it does not have any weight of authority to question the details of accepted science. However, the idea of some fundamental wave model has always appeared a logical model to pursue, even though it would require the concept of mass to be jettisoned at the sub-atomic scale and, as a consequence, removed from the definition of all fundamental units. However, having made this adjustment, a WSE model might then start to address some of the mathematical abstractions within the quantum model and therefore provide a better description of a physical reality that is still anchored in cause and effect. While modern science may now question the ideas of determinism, where every event has to be causally determined, and reductionism, where any complex phenomena or object can be explained in terms of simpler phenomena or objects, this does not necessarily negate the applicability of such basic ideas. For, in truth, the quantum debate regarding the epistemological versus ontological nature of reality has only been able to provide a mathematical description rather than what might be described as a fully coherent model of fundamental physics. For while the universe is undoubtedly complex in its scale and diversity, it does not necessarily mean that the most fundamental mechanisms cannot be essentially simple in principle. The issue of the absence of any wave amplitude [A] in Planck’s energy equation [E=hf] is addressed in a latter sub-section under A Matter of Inquiry . However, we might guess that the idea of amplitude might have gotten ‘lost’ in the definition of Planck’s constant [h], which has units of energy-seconds.